A good number of trail runners and hikers find the Salomon Speedcross 4 to be very comfortable. The traction is a monster on mud, snow, and even in wet conditions, according to a majority of the reviews. It has decent ground feedback, based on the observations of several users. The price is considered by many as well worth the performance and durability. The Quicklace system makes cinching easy and very convenient. The anti-debris mesh readily wards off dirt and trail debris. A handful noted that the outsole of the 4th version of the Speedcross is significantly more durable than the earlier version. Some runners welcomed the more rounded toe box for improved comfort and toe splay. A large number of runners praised the Endofit inner sleeve as it wraps the foot in comfort while the Sensifit overlays provide support and improved precision where fit goes. More than a couple of wear testers were amazed by the responsiveness and nimble ride for such a burly shoe. The high stack height and prominent lugs may cause some issues on uneven and rugged terrains. A handful remarked that it does not dry as quickly as they would want it to. Breathability is a bit hampered by the anti-debris mesh, according to a few. Some runners also mentioned that it is a bit smaller and narrower than the past version. The Salomon Speedcross 4 is something hordes of fans of the line will be very familiar with. There is still that insane traction on almost all surfaces, but with the added durability in the outsole to match its performance. It is quite light and nimble and comes in a variety of colors that will suit the fashion tastes of just about everyone. The running shoe excels on steep inclines, grass, loose gravel, and almost any slippery surfaces. The Salomon Speedcross 4 : An excellent pair of off-road shoes ready to climb mountains! I’m going to break this review down into the sections that I feel most important for me as a runner. However, I want to first give you an idea as to why I needed this kind of shoe and what I was looking for. 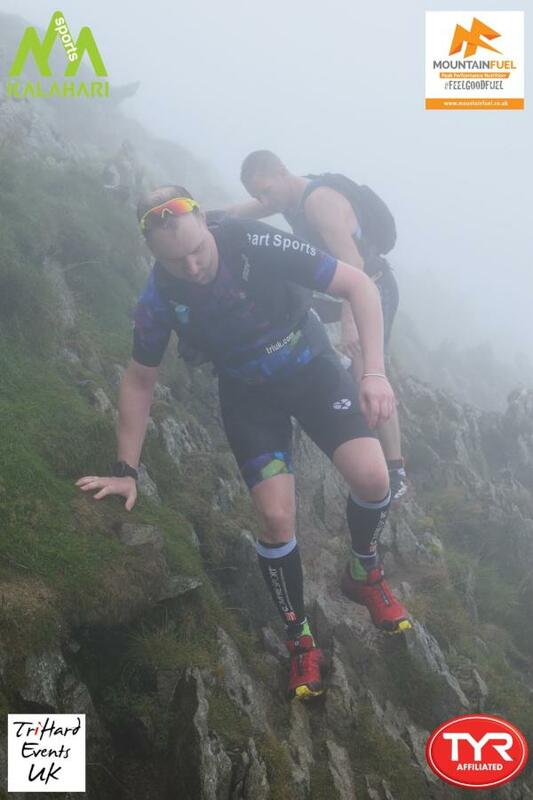 I entered the Helvellyn Triathlon in 2018 and needed a shoe capable of being excellent off-road, capable on rugged terrain and comfortable enough to endure 15km up and down a mountain in the lake district - not an easy task, but I was confident that I would find the right shoe. The upper mesh is breathable and quite robust. I did lots of research and discovered that the best shoe for off-road running is a non-gore-tex shoe since a gore-tex shoe will let water in but not out. The Salomon shoe keeps your feet dry and warm in good weather, and I found the shoe dried quickly when damp - so it was the perfect material. I felt like the upper had a shell structure and the toe box, in particular, was perfect to protect my toes when descending. For the size, I read lots of reviews, and many suggested sizing up, but I found that this was not necessary. I switched to mono skin hilly socks and found I had an excellent combination of comfort while being secure in the shoe. 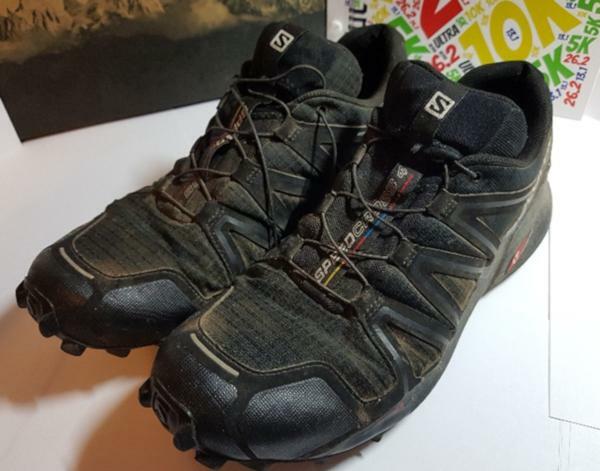 I also found many reviews saying the Salomon shoes had a narrow toe box, but interestingly I found them to be bigger than the Speedcross Vario. I also found the shoe very easy to clean with no staining - ideal for a shoe designed to be in muddy conditions. The final part of the upper, and arguably the best feature, is the lacing system. The SC4 shoe has a quick lace system that is designed to be pulled tight and secured using the clamp, and the remaining lace is tucked under a hood at the top of the tongue - a great feature to keep it secure when running. This system is simply excellent, hold the clamp and pull and then tuck. Perfect for racing. This system definitely helped my T2 on the day, and I noticed no slippage throughout the 15km ordeal. This is my first Salomon shoe, so I wasn’t sure what to expect for grip, durability, and comfort. I’m pleased to say that I was pleased with all 3. I have put roughly 40km on these as I had limited time prior to the event, but I expect to put many more miles on these through the winter. I have found the grip to be excellent - these have been tested in mud, looser gravel, rocks and steep rock climbs. These shoes also descend well with some of the lugs being reversed from descending grip as well as ascending. I would use these shoes for any off-road event. The durability so far seems great. I have seen many with missing lugs, but I have not suffered any degradation so far. The shoe comes with Salomon Ortholite insoles, and I was very pleased with the comfort on the 15km run. By the end of the race, my feet by some miracle, still in one piece and I was capable of running back to the campsite afterward. These were comfy straight from the beginning. It isn’t a particularly lightweight shoe, but it is designed to protect you while running off-road. This, in my opinion, is a necessary evil. As mentioned previously, these are easy to clean and look great - there are plenty of cool color variations, so I found myself plenty of choices. I had no regrets at this point of buying the Speedcross 4. Most of the running I do is on road, and I mainly like to stick to Nike trainers. These Salomon’s have made me consider switching my allegiance. Interestingly, I tried the Nike Wildhorse shoes but could not find a size that would fit without suffering any heel slip. The fit of the Salomon shoe is excellent, and the quick lace system works flawlessly. These are perfect off-road shoes which offer excellent grip, both uphill and downhill and overall toe protection. I was looking for a shoe capable of supporting me through a ridiculous triathlon, I found the needle in the haystack. These are perfect for off-road running with excellent grip and comfort. I was worried at the beginning that the size of the lugs might affect the level of comfort achieved but found that this was not the case. The lacing system is the best quick lace system I have used (which includes a few brands of triathlon laces), and I couldn’t have hoped for a better fit in this shoe. If you are looking for an off-road shoe for general use or an off-road running race or triathlon, then look no further as this will do everything you need it to and more. My first impression with Salomon Speedcross 4 is it looks good and feel good. The color is very eye-catching without being too bright. They have an element of black to them as well which detracts from the pink. Salomon Speedcross 4 has a slightly narrow tapered fit towards the toes. The upper part of the Speedcross 4 is a combination of an anti-debris mesh and stitched midfoot overlays. This means that the foot is held extremely secure. However, they are not as breathable as other shoes I have tried. This means that if they get wet, they don’t dry that quickly! The lace system is ‘QuickLace’ and is extremely helpful. You simply pull the laces as tight as you require, securing it with the toggle and then tuck the remaining lace inside the pocket of the tongue. This ensures that your laces are secure for the duration of your run, and trail runners can appreciate that muddy laces are not wanted. The interior of the shoe has an Ortholite sockliner which works well for anti-microbial and moisture wicking features; a must during trail runs. Although these Speedcross 4 are not gore-tex, I don’t think this is needed as the shoes provide enough cover for your feet for a moderate trail run. However, they do get wet as not 100% waterproof. If you were completing trail runs that consisted of running through water, it might be worth getting the gore-tex version. The structure of the Speedcross 4 is also incredibly supportive which is a necessity during off-road runs, in particular, running through uneven terrain. The height at the back of the shoe made me feel like my ankle is well supported during all of my trail runs, through all elevations. At 260g these are lighter than other trail shoes by different brands; however, they are heavier than a road shoe, and this was slightly hard to get used to initially, but purely because I was used to road shoes. These were my first trail shoes, and I must say they were an excellent choice as a first trail shoe. I chose them from reading other reviews, based on the support and grip they provide. I thought it would be best to have if not used to trail running. Due to the supportive structure of these shoes, they are less flexible than other running shoes. However, personally would much prefer the support, especially when running through uneven surfaces and elevation on trail runs. You definitely get used to this after a short while during your run. Due to the supportive nature of the shoes, the Speedcross 4 could be slightly tight for some runners. However, they have just released a wider version so it may be worth going for the wide version if you have wide feet. A thick layer of EVA acts as the primary cushioning material and provides added protection to the rough surfaces and surface on trail running. It also provides enough support, so you don’t feel every sharp object you encounter while trail running. The outsole uses Contagrip rubber which is amazing with grip even on wet surfaces. The shoe also features 6mm arrow-shaped lugs which provide extra bite when running on uneven surfaces. The lugs sit opposite one another, which offers multi-directional grip. The downside of these lugs, if you run through an unusually wet thick surface (mud/clay), the material does stick to the bottom of your shoe. You have to make sure you get this off as it can make a difference to the weight of your feet! At around 50-100 miles usage, the midsole, outsole and cushioning is holding up extremely well and has continued to hold up well up to approximately 170 miles. I am quite comfortable with taking these shoes out on consecutive days as the midsole cushioning is extremely supportive and doesn’t seem to reduce with repetitive action and running. As mentioned before, if new to trail running these elements of the shoe really helps acclimatize the runner to trail running. After more than 200 miles, you can see in the image that the cushioning and the lugs are still providing grip where it is needed. The picture also shows where the shoe has accumulated some drier mud through my run. The variation of colors that come with Speedcross 4 is second to none. There is a vast range of contrast in colors and is definitely a strong suit of Salomon. You can choose from blending in and going with darker colors, to picking bright yellow, reds, and greens. As a consumer, there is plenty of choices. As I have mentioned before, they are now available in ‘wide’ as well. Having used these as a first trail shoe since branching out into trail running, I would recommend Salomon Speedcross 4. I have stepped up my trail running and used these in all weathers; through all the seasons. I would definitely recommend these as a first trail running shoe and also as a heavy duty autumn/winter trail running shoe, especially as they are lighter than other trail running brands. I use these for various distances, from 5km park runs to marathon trail running events. They can be quite expensive compared with other running shoes; however, if you are not fussy on color, then you can pick up a pair in your size for around 40% less than RRP if shopping around online. The iconic Salomon Speedcross 4 is built tough with aggressive tooth-like treads to help you tackle any rocky trail or muddy terrain. Due to their extraordinary traction, these durable shoes are a mainstay for trail running and remain a favorite amongst obstacle course racers worldwide. Ready to rip up the trails on your next run? The Salomon Speedcross 4 certainly have your back. Right out of the box, I loved the aesthetics of the Speedcross 4 as I was elated to find that the shoes came in neutral blue hues especially for those who prefer low key color schemes. Furthermore, Salomon offers a variety of colors to choose from to suit your personal style preferences. Outfitted with a water-resistant textile and anti-debris mesh, this shoe is built robustly to resist rain and debris from hindering your running endeavors. The outsole is my favorite feature of these shoes as they are stacked with 6mm aggressive arrow-shaped lugs made of Contragrip rubber to help you tackle any rugged terrain. I’ve ran in these shoes on trails, tight switchbacks, in the mud, in the snow, in the rain, and all over the place in these kicks and not once did I ever feel myself slipping or sliding, thanks to the exceptional traction. I mainly used these shoes for both trail running and obstacle course racing (OCR) which means lots and lots of muddy terrain. Moreover, I love the arrow design because they didn’t allow copious amounts of mud to cake on the bottom of the shoes, essentially allowing me to continue to grind without sacrificing grip. After about 120 miles in these shoes, the treads were showing some wear, but still, continue to perform great and have life in them. Sitting on a 10mm drop, the Speedcross 4 encompass a molded EVA foam cushioning protecting your precious feet from rocky, rough trail surfaces. Without sacrificing comfort, these shoes are still quite responsive while practicing your mountain goat-like trail running skills. I’d love to say that these shoes are comfortable right out of the box, but they required quite a lengthy break-in period for me. The shoes run true to size, but I had to put in about 30-50 miles in these shoes before I felt like they began to become somewhat comfortable. I have neither wide, nor narrow feet, yet I developed hot spots and blisters on my toes. Sadly, it still happens from time to time depending on how long I’m running in these shoes. With that being said, I’d rate the toe box of these shoes to be more on the narrow side. On the plus side, if you like a snug fit, the Sensifit design of the shoe hugs your foot, so you never have to worry about your foot sliding around when your running on the side of a mountain. It’s all about preference here on what you desire in a trail running shoe. After the “break-in period” the cushioning on these shoes are great for long distances. The traction certainly did not disappoint as I’ve used these for both trail running and OCR and I was incredibly impressed! No matter if I was running uphill in the mud or bombing down a slippery downhill, I didn’t have to worry if I was going to slip because of these killer treads. As mentioned previously, the ingenious design of the arrow-shaped lugs makes the Salomon Speedcross 4 a force to be reckoned with. Equipped with a quicklace pocket, Salomon is notorious for their no-tie lacing system which is a great feature knowing that you’ll never have to worry about an untied shoe during any of your running excursions. Biomechanically, these shoes are designed for the classic heel striker. Being a midfoot striker, I did notice during long runs I had a tendency to heel strike in these shoes which I wasn’t too happy about. I was accommodating the shoe more than it was accommodating me. In addition, perhaps if the shoe had an option for those with wider feet, it would be desirable for a larger variety of runners as the shoes err of the narrow side. For obstacle course racing, in particular, you can always expect wet and muddy conditions. The water-resistant textile of the Salomon Speedcross 4 hinders the water shedding capability that is desirable for those looking to race OCR in these shoes. Also, at 260g these shoes are relatively heavy, particularly for racing. Otherwise, the heavier weight could be beneficial if used as a training shoe. Futuristically, Salomon should create a race model of the Speedcross shoes that are lighter in weight and have greater ventilation and water-shedding abilities. My purchase of these shoes came out of necessity, and hindsight. After completing a very hilly and muddy trail race at Larmer Tree Gardens in Dorset, I realize that on the hills, trying to run in road shoes was more of a hindrance than actually walking. I realized I needed to get something with some grip! The upper of the Speedcross 4 at first glance doesn’t seem to be as breathable as a road shoe. However, trail running requires a different kind of beast. I would say there is a Speedcross 4 GTX or Gore-tex version of these shoes, which will provide a lot more in the way of waterproofing. However, from the types of trail races that I have partaken in, they require you to go through a number of bodies of water which are normally above ankle height. And my thoughts were, if the GTX is designed to keep the water out, they will probably also be great at keeping the water in! The textile used for the shoe feels very durable and over the 400+ miles that I have used them for, they have only just started to show signs of wear and tear. The front top guard and grip that links with the sole is a great design feature and seems to provide a good amount of support and protection. Having stumbled, kicked and fallen over in these a number of times, I have never had an issue with hurting my toes or front of my foot. In terms of flexibility, these are not as flexible as road shoes. I believe this is due to the need for a more durable and sturdy shoe to cope with the rough and uneven ground that is more prevalent in trail running. I did notice the shoes did need a few more miles for my feet and shoe to adapt to each other, I would say around the 15-20 mile mark is when I started to feel very comfortable in the shoes. At this point, they had loosened up and had adapted to my feet. The heel and sides to these shoes provide additional support compared to that of most road shoes and a number of trail shoes. This helps with the uneven ground and adds additional support in case you end up turning or rolling your ankle on the rough terrain. I was glad it was there, as they seem to have prevented a number of potential injuries. The Speedcross 4 does come in normal and wide variations. So for those of you who do require a wider shoe, you’re in luck. I have heard a number of comments from fellow runners that these do feel narrower than some road shoes. It would be worth trying them out before committing to the normal or wide size. The only downside on the wide versions is that they do come in fewer colorways or variations. The Speedcross 4 has a large number of color variations. From darker simple one color tones to more vibrant color schemes with multiple colors. Each season, Salomon seems to bring out a new range of colors which ensures a fresh look and feel to the shoes themselves. I have just gone for a new pair of blue 4. Being one of the leading brands within trail running and having the support and sponsorship of some of the major trail runners, the Salomons always manage to stand out. If you are looking for a practical and colorful trail shoe (or even an all-black version), Salomon will have a color for you. I originally took from the mentality of Henry Ford when choosing my color for my first pair of these shoes - “any color that he wants, so long as it is black.". The Speedcross 4 uses something called LT Muscle for the midsole. At first feel, this has quite a bit to give and seems like it will give a large amount of cushion. Testing out the compression of the midsole seems promising with the midsole springing back into place quickly. At around 50-100 miles usage, the midsole seems to be holding up well. I have been surprised at how comfortable and how much cushion it has. The midsole works and reduces the impact in various terrain. I haven’t as yet used them for multiple runs in a single day. I find that I should use these for the wetter conditions and when I feel like going off-road. But from the multiple runs in a week, the midsole doesn’t seem to be impacted at all. After more than 450+ miles, you can see in the picture that the grip has worn down in places and is starting to go in others. I would say that the shoes do still feel like they have a grip as there is still a large number of lugs on the soles. I have noticed that due to the lugs being made of rubber, they seem to wear down on road and more solid surfaces. The image below shows the state of the lugs at this late stage for these shoes. There is a number of small tears towards the inside of the mesh, at the point at which the shoes flex. These have only begun to appear at around 430 miles. At this stage, I have ordered a new pair as I've been more than happy with how durable and strong these have been in various terrain that I have thrown at them. At 310g (men's) and 260g (women's), these are around the heavier range in terms of weight for comparable trail running shoes within its category. However, I would say these are more of an entry level trail running shoes. Some of the lighter weight shoes are more expensive. 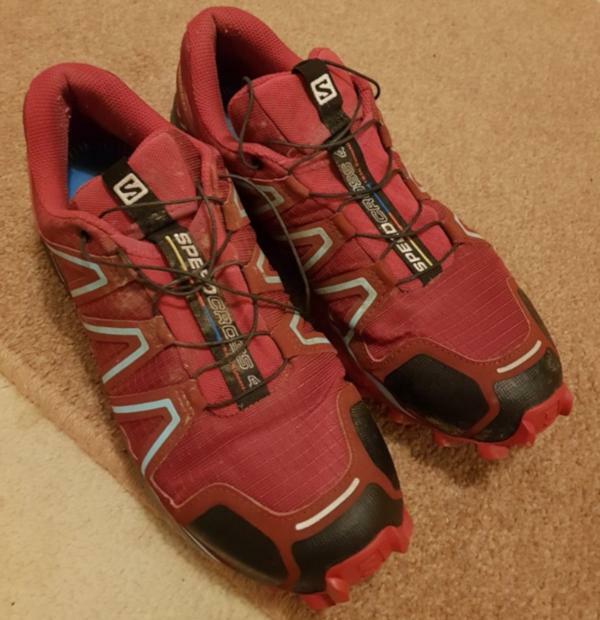 However, if you can afford it or have the desire to, I would suggest a lighter weight trail shoe as a ‘race shoe’ like the Salomon S-lab Sense 6. Trail running and logging those training miles - an everyday runner for trails and the occasional race shoe. Can withstand a lot of miles, terrain and any weather you can throw at them. They were starting to look tired at around 450 miles. But the grip is still there. I would say to avoid roads and solid surfaces as they will wear away at the grip more quickly. Beginners - a good shoe for starting to explore trails and dipping your “shoe” into the world of trail running. A great shoe to give you the support and grip that you will need to start to develop your trail running techniques, and is forgiving and will support you if you happen to make mistakes. Great for any distance from 5k (even the more trail based Parkruns) all the way up to marathon distances. These will last a long time, I only noticed the wear and tear after 450+ miles, and if you have these as a secondary shoe to your road shoes, they will work great! Intermediate - for the more experienced runner and one who’s clocking a lot of miles with experience in a variety of terrains, I would suggest that this would be a good shoe to go alongside a pair of road shoes. I would not use these for road running but as a supplementary off-road shoe, these work great. 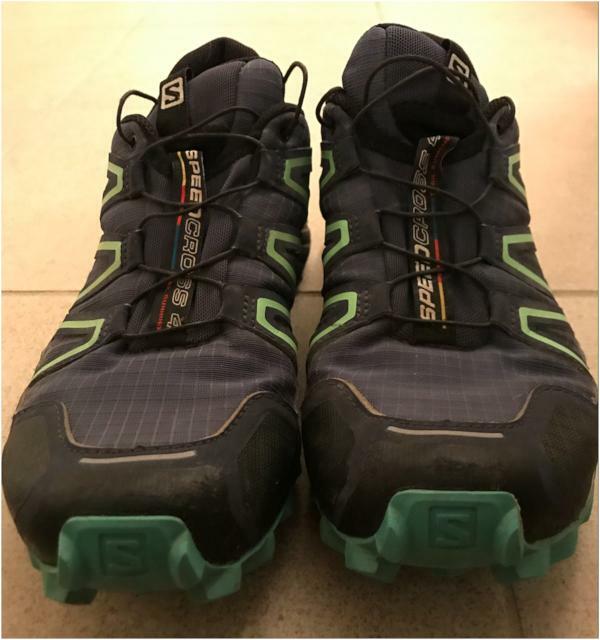 Also if you are starting to get more competitive and enter more races, maybe look into a 'race' shoe, I would suggest the Salomon S-Lab Sense 6. Experienced - if you are into running, and know your shoes, then you probably already have a good idea of what you are looking at. Having only used Nike shoes for running previously, I have found these to be a great addition to my running repertoire. If you have a lot of experience on the trails and have mastered trail running techniques, I would say that this may be a bit too heavy and clunky for you. Triathlete - I would not suggest these as a main running shoe for a triathlon unless that is you are competing in a trail triathlon or run section that is on trails. The lug pattern will more likely hinder you whilst road running. However, the Quicklace™ system is great and would be great for those quick transitions. If you can find a similar system on a road runner then you’re in luck! Having developed my passion for running and desire to get off the roads and explore some of the depths of Dorset’s finest countryside, I decided to get some trail shoes. After hearing a lot about the Salomon brand and mainly positive things, I decided to try the Speedcross 4 out. I would say these have been the ideal shoe to be able to traverse and explore a multitude of terrains through different weather conditions. The grip and lugs on the bottom of these shoes have been amazing, and at no point have I felt that I haven’t had a grip. Having partaken in plenty of trail races, they have again and again proven to be a great shoe with amazing support. A number of times I have come close to rolling my ankle, however, the support of the Speedcross 4 has been amazing and stopped me from causing an injury. Salomon hardly ever makes changes in the Speedcross line and this is true in the 4th version of this series. As it is a trail shoe, the most substantial changes are made in the outsole. Unlike the past models where half-sized lugs often found themselves on the shoe's perimeter where they are easily abused and pounded, the underfoot now uses full-sized lugs all over. The bite on uneven terrain is enhanced without too much damage. An updated version of the Contagrip rubber compound finds itself in the outsole as well. The new version of the Contagrip keeps the runner sure-footed on slippery or wet surfaces. This update is one reason the traction is simply unbelievable in this shoe. The fit of the Speedcross 4 is a trademark of this line. It has a slightly narrow to medium fit all over. The upper hugs the foot well in comfort and security. There is decent padding in the right areas of the shoe for the foot to be very comfortable. It runs true to size. Same as in the popular Salomon Speedcross 5, the outsole of the Speedcross 4 uses the Contagrip rubber for superior traction, even on wet surfaces. Giving the shoe exceptional bite on rugged terrains are the 6mm arrow-shaped lugs. The lugs face opposite each other for multi-directional grip. Because the shoe does not have a rock guard, the lugs act as a buffer against the often pointed or sharp objects on the trails. The midsole is a rather thick slice of molded EVA as the main cushioning material and added protection against the rough surfaces or objects on the trail. It covers the entire midsole and helps with the momentum from landing to toe-off. It also has standard durability and responsiveness. The Salomon Speedcross 4 is also equipped with the notable LT muscle compound. It is a lightweight EVA cushioning material that absorbs impact forces in every step. A removable Ortholite sockliner is also inserted into the midsole of the shoe. It is meant to provide an odor-free environment and it has an anti-bacterial element to keep the foot healthy and fresh. The sockliner is also designed to give additional underfoot cushioning. Designed for trail running, the Salomon Speedcross 4 makes use of an anti-debris mesh on its upper. The mesh material is very breathable and lightweight. It offers a good level of protection as it keeps the dirt and trail debris out of the shoe. Along with the anti-debris mesh is the water-resistant textile. It Keeps the foot dry while running on puddles or wet running surfaces. The textile is durable and it does not compromise breathability and comfort. A mudguard is specifically placed all around the base of the shoe for added protection against mud and dirt. The mudguard, a protective element, remains light yet durable. Salomon’s unique SensiFit system is at work in the upper of the Salomon Speedcross 4. The SensiFit overlays wrap the foot comfortably. The overlays give runners a close, secure foot lockdown without giving a constricting fit. The stitched midfoot overlays are directly connected to the QuickLace System, which is made from sturdy Kevlar fibers. They function together to hold the foot securely and with excellent comfort. Getting the right fit is made easier with a quick tug of the lacing system. It stays true from the first stride to the finish. There are also lace pockets to keep the laces out of the way. The Speedcross is one of the iconic trail running shoe model from Salomon. The Speedcross series is known in the running community for its protective design and grippy outsole. Below are some characteristics that make the Speedcross series really popular. All the Salomon Speedcross shoes are tough-looking, but on the inside is a soft cushioning and irritation-free fabric lining. The latest version, the Salomon Speedcross 4 offers a smooth in-shoe feel and comfortable underfoot foam. The Sensifit Technology also offers a comfortable yet secure lockdown. The running shoes in the Speedcross series are versatile enough to perform well on hiking, walking and racing activities. They have deep lugs evenly placed in the outer sole for uphill and downhill grip. The Salomon Speedcross 4 also has water-repellent textile coverage for extra wet weather protection, making it ideal for both warm and rainy running conditions. One notable characteristic of the Salomon Speedcross series is the grippy outsole. It is made possible by the Contagrip rubber material with aggressive lugs that offer superb traction on muddy, wet and even snowy surfaces. This material is also durable and protective enough against sharp rocks and other trail elements. All the Salomon Speedcross versions are equipped with protective elements, from the upper to the outsole. To prevent water from entering the shoe, the upper is covered with water-repellent fabric, and the mudguard serves as the shield of the foot from dirt and debris. For durable underfoot protection, a rock plate is inserted in between the midsole and outsole. It is durable enough to protect the foot against sharp objects. This extra foot shied is light, flexible and sturdy. The Speedcross models, especially the Salomon Speedcross 4, have a good looking design. Some runners are wearing them on casual days or even at work. They have a street-ready design which makes the shoes easily worn with shirts, shorts, and pants. Compared to the other trail running shoes that offer the same level of protection, grip, and durability, the Salomon Speedcross 4 has a more affordable price. It is one of the reasons why the shoe become popular to most trail runners. The Mutant is a durable and reliable trail shoe from La Sportiva. Meant for daily running, the shoe has an average weight - not too heavy and not too light. Just like the Salomon Speedcross 4, the shoe features a sticky outsole, responsive cushioning, and supportive upper. For the outsole, the shoe features the FriXion XF technology for traction and sole durability. La Sportiva also makes use of the V-Groove technology with Impact Brake System for breaking power and flexibility. The tongue and the lacing system of this trail running shoe are unique. It uses a Spyraltongue for a personalized fit and added protection. The Fusiongate Lacing Harness system offers efficient lacing system for a secure running experience. Brooks is known for its reliable trail and road running shoes. The Cascadia 13 features a breathable upper, responsive cushioning, and reliable traction. Built with durability in mind, the shoe offers unmatched durability. Just like the Speedcross 4, the Brooks Cascadia 13 aims to provide impressive performance on varied trail surfaces. Some of the technologies used include the BioMoGo DNA, HPR Green compound, Ballistic Rock Shield, and 3D Rubber Print Mud Guard. These elements offer a good blend of cushioning, durability and protection. Lastly, the Cascadia 13 is also available in a waterproof version. Another trail shoe from Salomon is the Ultra Pro. The shoe is a bit expensive but it offers an excellent and durable performance. To provide runners with durable traction they experienced with the Speedcross 4, the shoe makes use of the Premium Wet Traction Contagrip with 5mm lugs. This outsole design gives an unmatched grip on both muddy and rocky surfaces. Along with the Contagrip outsole is the Dual Density EVA midsole, 3D Stretch Mesh upper, seamless SENSIFIT element, and QuickLace system. The Salomon Ultra Pro is lighter than the Speedcross 4 but both shoes are designed to tackle the toughest terrain. The first Salomon Speedcross was released in 2016. The purpose of the shoe is to provide runners with a reliable trail shoe that can survive wet and muddy terrain. Salomon Speedcross trail runner endorsers include Kilian Jornet, Philipp Reiter and Anna Frost. The Speedcross 4 is also available in a waterproof version.